The TV and other forms of media in Japan have been filled since yesterday with news about the death of Kim Jong Il and speculation about what will happen next in North Korea. Newspapers were driven into a frenzy with extra editions printed. The nightly news went for an hour instead of half an hour. At least according to North Korean media. Makes you wonder if someone there has a sense of humour. Who could write that with a straight face? North Korea is one of the most bizarre places on Earth. It is one of my greatest regrets that my dream of living there will probably now not come true. That's what happens when you marry a Japanese woman I guess. Media speculation has centred around the succession to Kim Jong Il. He had three sons. The oldest, Kim Jong Nam, was caught in 2001 trying to enter Japan on a fake passport in an unsuccessful attempt to go to Tokyo Disneyland. I am not making this up. He was deported and the incident apparently raised questions about his leadership abilities. Makes you wonder. If the passport had been of slightly higher quality we might now be facing a completely different leader, one who likes Mickey Mouse. The second, Kim Jong Chul, is said to have a weak character. The third, Kim Jong 'Pork Chop' Un, has been anointed as leader and will very likely succeed, though for a long time he may be merely a figurehead. He shares his late father's dress sense and apparent appetite for fried foods. He was also apparently educated in a prestigious Swiss boarding school. 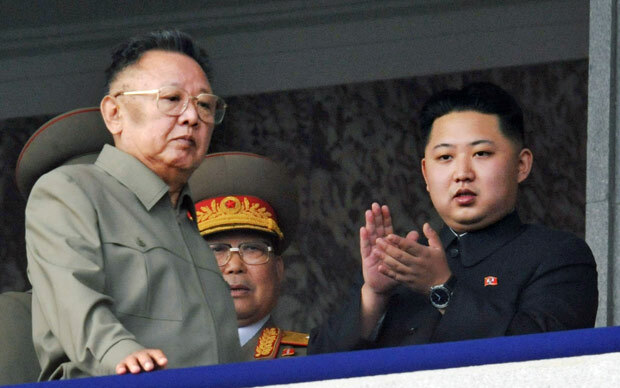 The late Kim Jong Il with his son Pork Chop on the right. The Japanese media is also speculating futilely about the abduction issue. Hopes have been expressed that Pork Chop will address the issue of Japanese nationals who were abducted by North Korea back in the 70s. The North Koreans returned five such abducted Japanese several years ago, but unfortunately for Japan, the chances that any others are left alive in North Korea approximate the chances that Kim Jong Il will go on a diet soon.